The Seesoft CE-Level 2 back protector insert is designed to absorb variable impacts without compromising on comfort, ventilation or freedom of movement. The highly impact-resistant blend of Nitrille and Polynorbornene rubber results in a memory foam that is multi-impact rated and CE certified to the highest level (EN 1621-2:2003 - level 2). 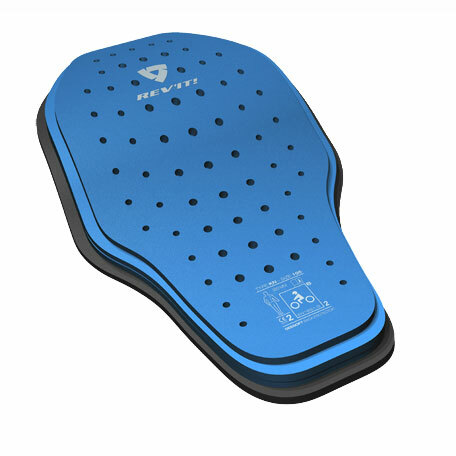 In the case of severe angular impact, the individual Memory foam layers will shift relative to one another, resulting in impact dispersion over a larger effective surface area, and therefore minimizing the energy that is transmitted to the spine and back. By applying a multiple-layer concept, REV’IT! has developed a flexible back protector insert that performs consistently in all conditions. SIZE 105: XS-S/ 34-38 (WOMAN). SIZE 106: M-4XL/ 46-62 (MAN)/ 40-48 (WOMAN).